Quick. Healthy. Fast. Delicious? Say it ain't so! 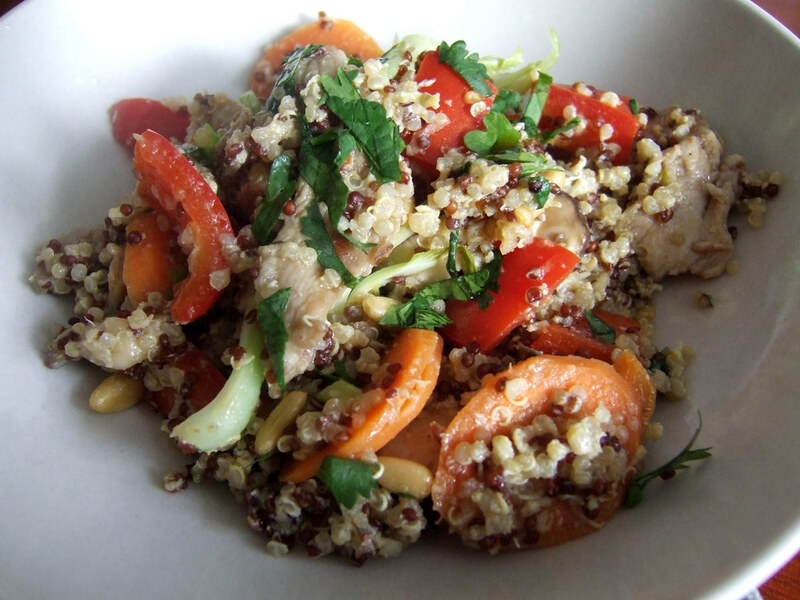 I came across this recipe for a Quinoa Stir-fry over on Handle the Heat and became instantly intrigued. 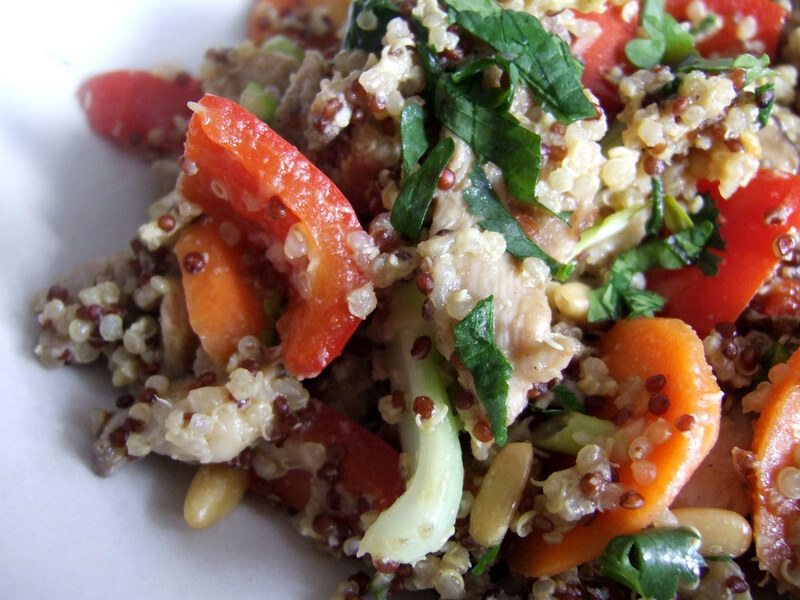 Quinoa in place of rice (healthier and faster!). A great way to use up veggies in my fridge. Ready in minutes. I knew this dish was calling my name. While quinoa is a complete protein source, you can also throw in a little extra lean meat, like chicken breast, lean pork, grilled fish, or tofu to make it a more satisfying meal. Use whatever fresh vegetables you have in your fridge, the more colourful, the better. The toasted pine nuts, while optional, add some crunchy texture to the stir fry. Place all the ingredients for the marinade in a small bowl and mix to combine. Set aside for at least 15 minutes. Place quinoa in a small saucepan with 3/4 cup water and salt. Bring to a boil, then reduce heat to low. Cover and cook, undisturbed, until quinoa absorbs water, about 15 minutes. Remove from heat, fluff with a fork and leave uncovered. Heat some oil in a large skillet over medium-high heat. Cook carrot and chicken, stirring occasionally, until carrot softens and chicken takes on some colour, about 2 minute. Add bell pepper and bok choy; cook, stirring frequently, about 2 minutes. Add shiitake mushrooms and cook, stirring frequently, for another 2 minutes, or until chicken is cooked through and vegetables are tender-crisp. Remove vegetables and chicken onto a plate and set aside. Return skillet to the heat and add some vegetable oil to coat the bottom. Add the eggs and swirl to coat the pan. Quickly add the cooked quinoa and stir constantly until the eggs are evenly distributed, about 2 minutes. Return the vegetables and chicken to the pan and heat through, tossing to combine. In a small bowl, stir together soy sauce, rice vinegar and water, and drizzle over the stir-fry, to taste. Sprinkle over the scallions, cilantro and pine nuts. Divide stir-fry among 4 bowls and serve immediately, drizzling with some of the extra soy-vinegar sauce if desired. Posted by Bonita at 7:36 p.m.
c h r i s t i n e April 27, 2010 at 9:46 a.m. I really can't wait to try this recipe, thanks for posting it, Bonita!